Two thousand years ago, Jesus paid the debt we could not pay. His victory over death became our victory, setting us free to experience new life and share it with others. 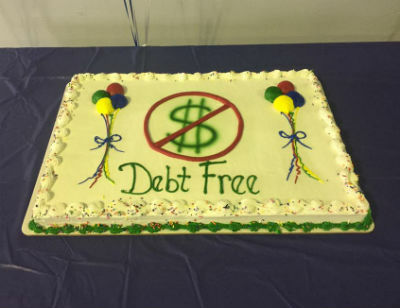 Until freedom reigns, debt has a way of holding us back, enslaving us to our past. 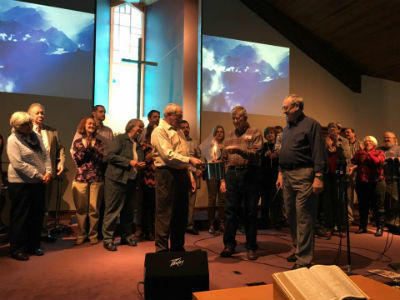 First Church of God in Jefferson City, Missouri, found themselves in this very predicament. While thankful for the grace that covers their spiritual debt, the debt that stared them down, barring the way forward, was financial. This debt kept them from experiencing God’s best and embracing the future he’d planned for them. Then, early last year, the capital city congregation fixed their eyes on Christ and boldly stepped out of the boat. Photo: Celebrating God’s goodness at First Church. 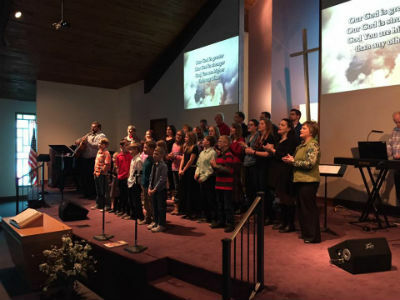 At the beginning of 2016, the modest-size congregation faced nearly $70,000 in debt. The notion of eliminating all of it in just one year was, for some, difficult to imagine. But under Pastor Joe’s leadership, the church accepted the mission and began a season of focused prayer and fasting. Faith wasn’t so hard at the beginning, when the excitement of a new project hadn’t worn off and the end of the year was still beyond the horizon. Things began to change, however, when October came and the church still had a long way to go to reach their goal. Some began to wonder again if the church had set a date prematurely. “No, it is in times like these that our faith is tested,” Pastor Joe would explain to the church. They would persevere, keep asking, and continue pursuing the Almighty. Not knowing how and when God would show up had to be the most difficult part of the process, but it would make the victory over debt that much sweeter. On January 29, the church pulled out all the stops in celebration of all God had accomplished. From the worship service, to the ceremonial burning of the mortgage, to the feast following the service, it was a day few could forget. It was also a day that marked the beginning of a new era of ministry at First Church: Envision. The new campaign is already underway, allowing the church give their campus a facelift and envision what God has in store. As a strategic move to position the church for continued growth, the congregation is funding the Envision campaign as they go—no additional debt! In Jefferson City, Missouri, across the United States, and around the world, God is on the move in the Church of God. Join the movement. Donate today at http://www.jesusisthesubject.org/join-movement/. This entry was posted in All Church of God, Central and tagged bold, building campaign, celebration, debt, expansion, faith, financial freedom, goal, Jefferson City, Jesus, Joe Gregory, Joseph Gregory, Missouri, MO, mortgage burning, stewardship. Bookmark the permalink.